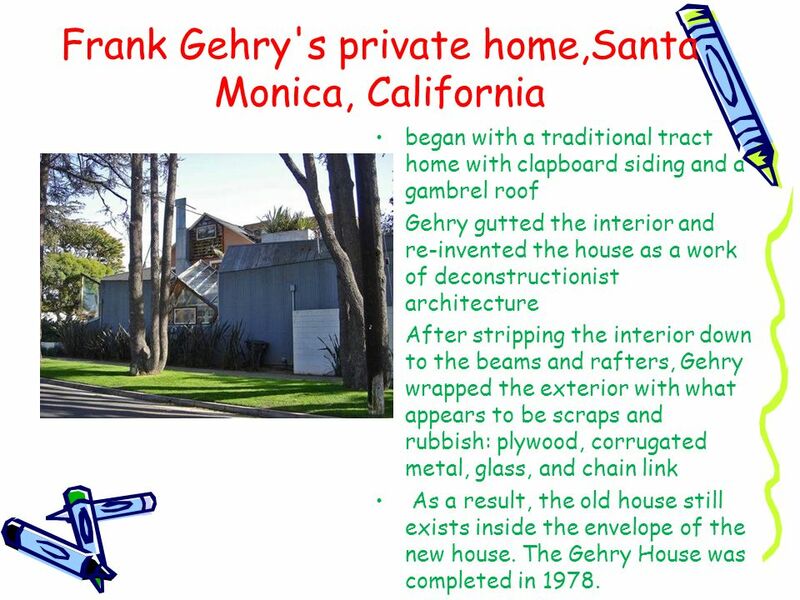 5 Architectural style Much of Gehry's work falls within the style of Deconstructivism Santa Monica residence is a commonly cited example of deconstructivist architecture, as it was so drastically divorced from its original context, and, in such a manner, as to subvert its original spatial intention. 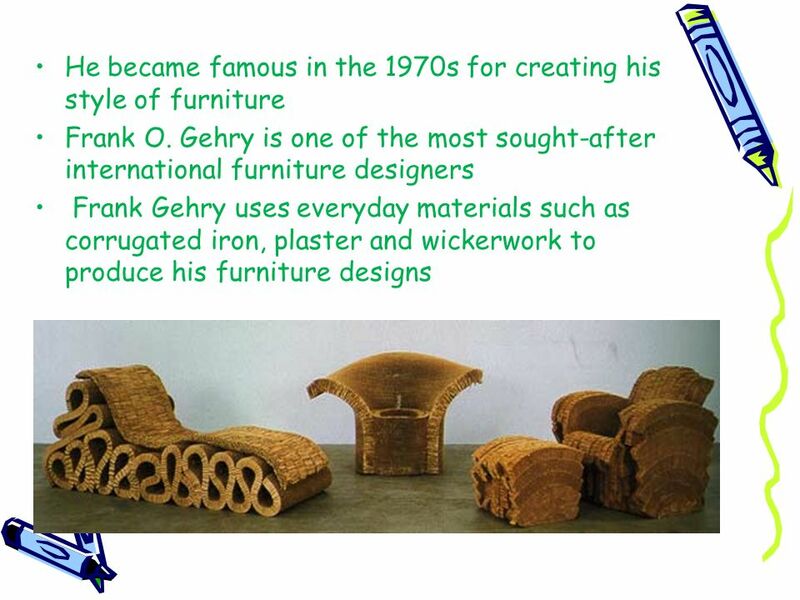 Gehry’s style at times seems unfinished or even crude featured the use of inexpensive found objects and non-traditional media such as clay to make serious art. 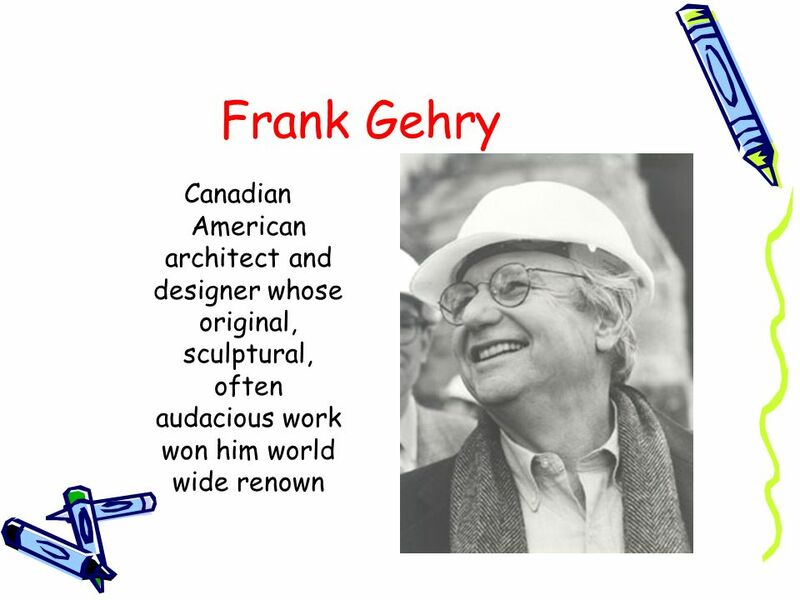 Gehry has been called the apostle of chain-link fencing and corrugated metal siding he is also a sophisticated classical artist, who knows European art history and contemporary sculpture and painting. 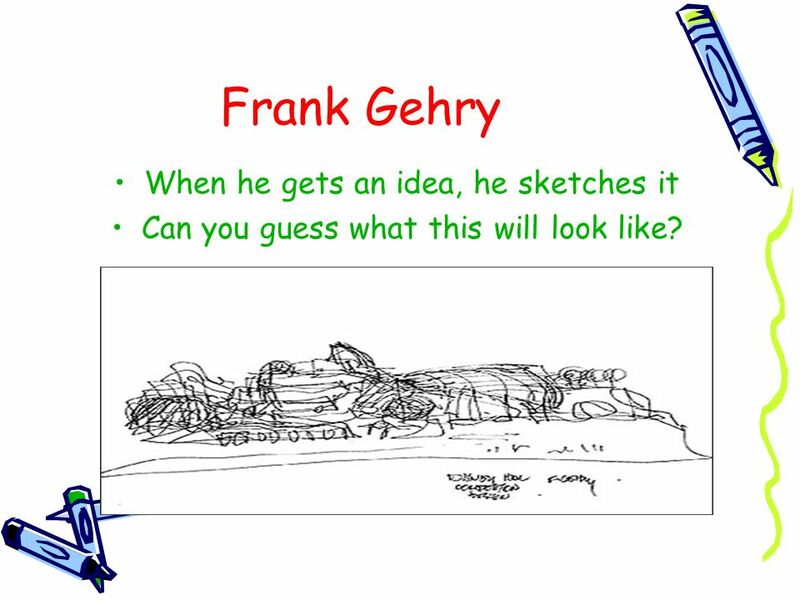 7 A Gehry building begins with a sketch, and Gehry’s sketches are distinctive. They’re characterized by a sense of off-hand improvisation, of intuitive spontaneity. The fine line is invariably fluid, impulsive. 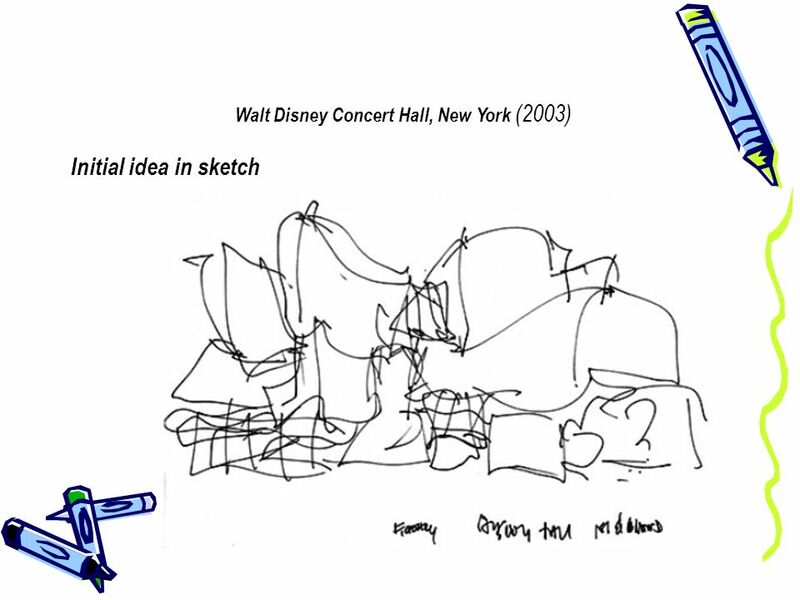 The drawings convey no architectural mass or weight, only loose directions and shifting spatial relationships. 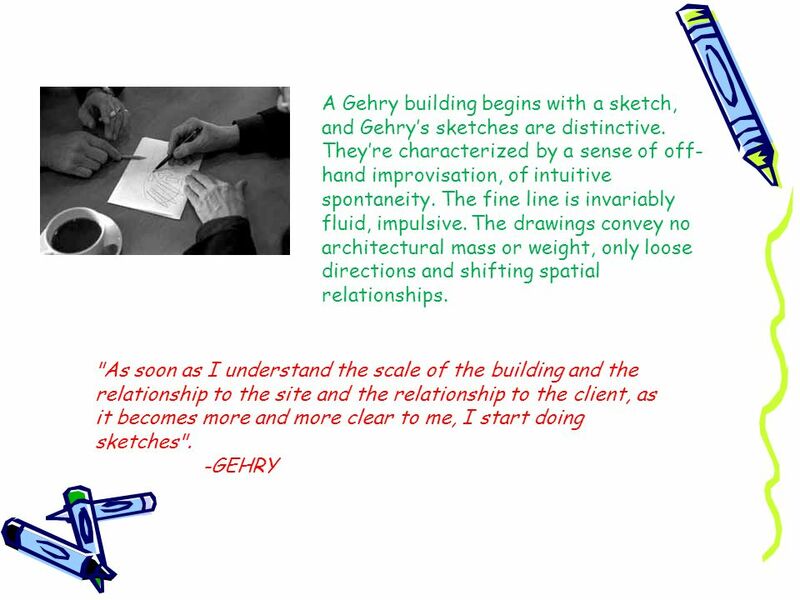 "As soon as I understand the scale of the building and the relationship to the site and the relationship to the client, as it becomes more and more clear to me, I start doing sketches". 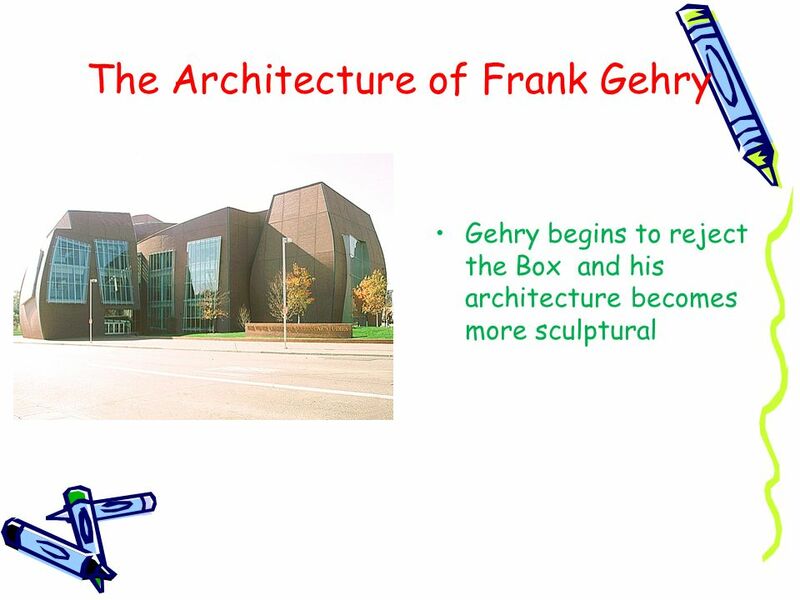 -GEHRY The drawings convey no architectural mass or weight, only loose directions and shifting spatial relationships. 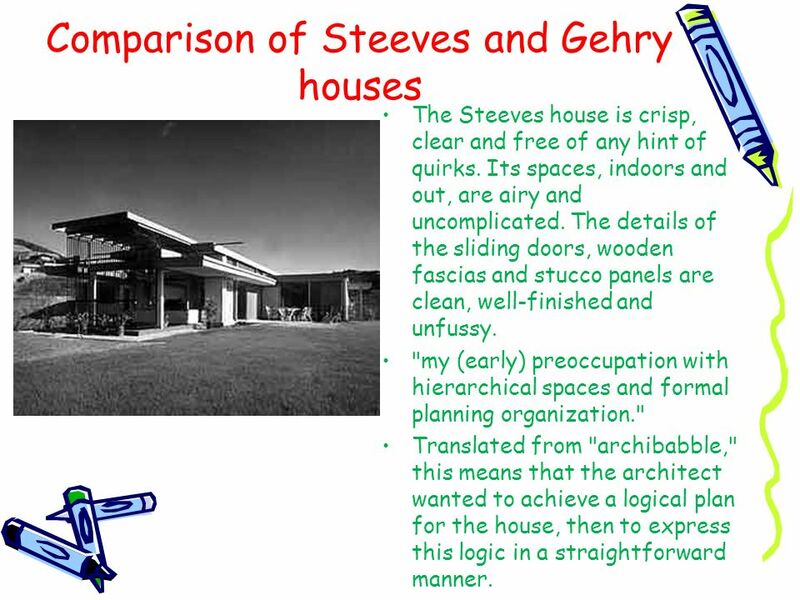 The Steeves house is crisp, clear and free of any hint of quirks. Its spaces, indoors and out, are airy and uncomplicated. The details of the sliding doors, wooden fascias and stucco panels are clean, well-finished and unfussy. 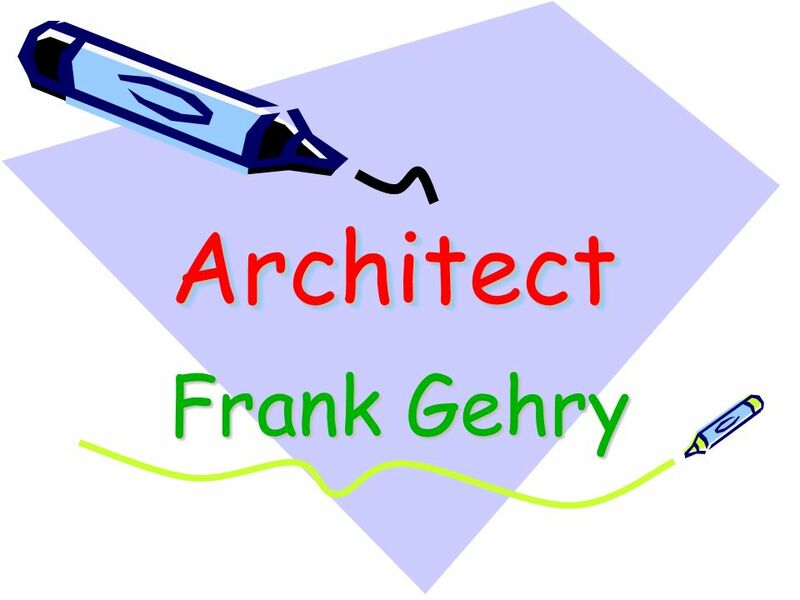 "my (early) preoccupation with hierarchical spaces and formal planning organization." 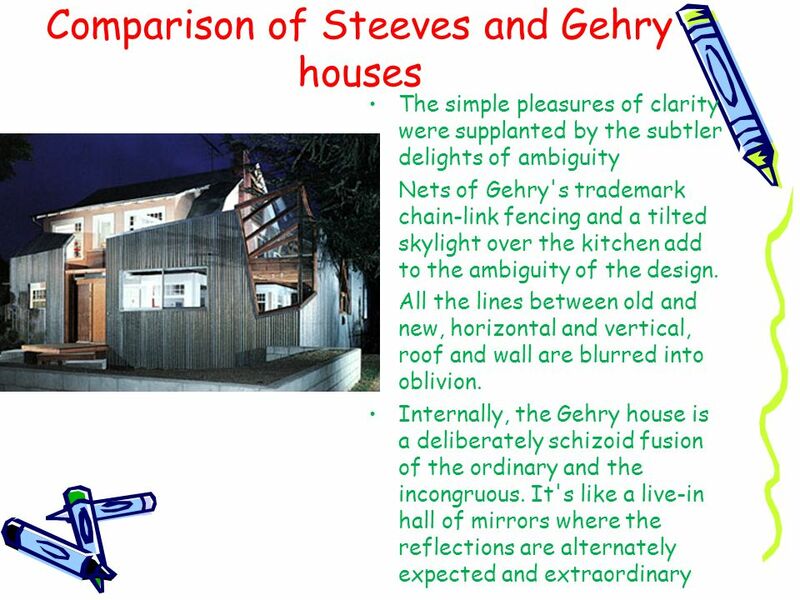 Translated from "archibabble," this means that the architect wanted to achieve a logical plan for the house, then to express this logic in a straightforward manner. Can you guess what this will look like? 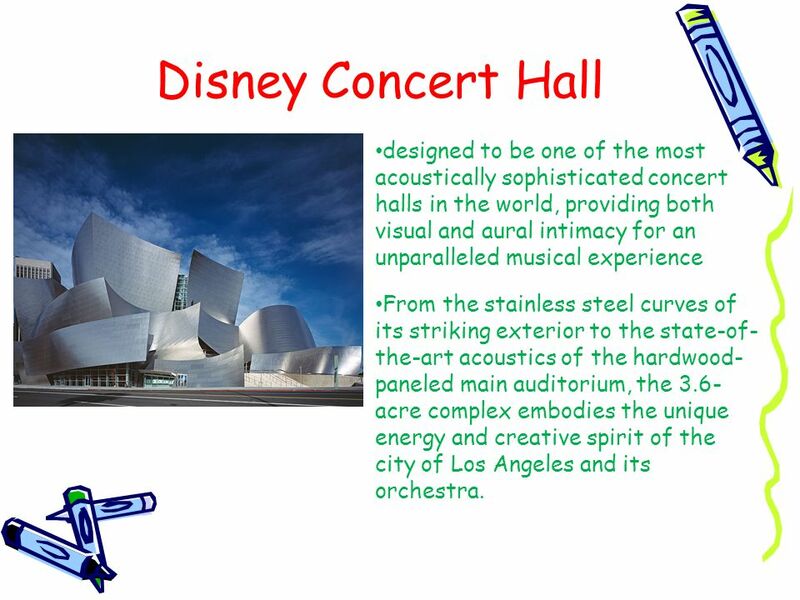 24 Disney Concert Hall designed to be one of the most acoustically sophisticated concert halls in the world, providing both visual and aural intimacy for an unparalleled musical experience From the stainless steel curves of its striking exterior to the state-of-the-art acoustics of the hardwood-paneled main auditorium, the 3.6-acre complex embodies the unique energy and creative spirit of the city of Los Angeles and its orchestra. 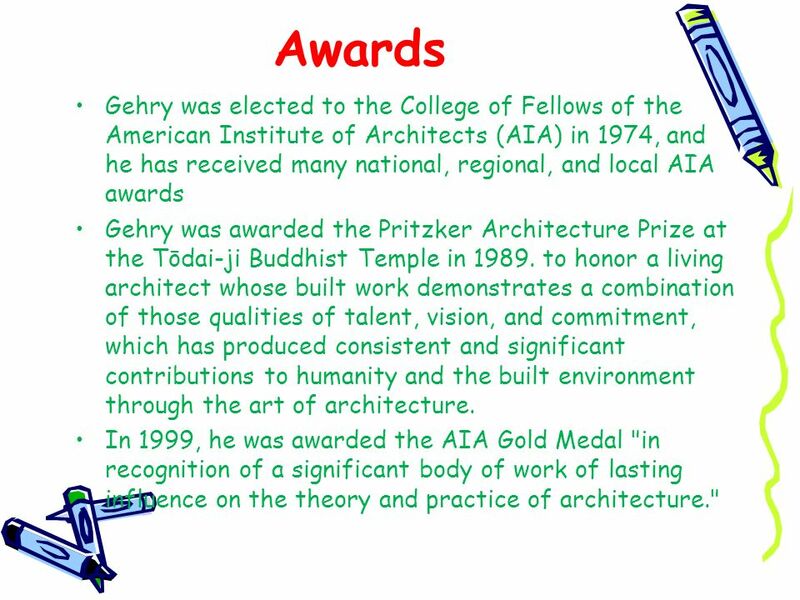 26 Awards Gehry was elected to the College of Fellows of the American Institute of Architects (AIA) in 1974, and he has received many national, regional, and local AIA awards Gehry was awarded the Pritzker Architecture Prize at the Tōdai-ji Buddhist Temple in to honor a living architect whose built work demonstrates a combination of those qualities of talent, vision, and commitment, which has produced consistent and significant contributions to humanity and the built environment through the art of architecture. 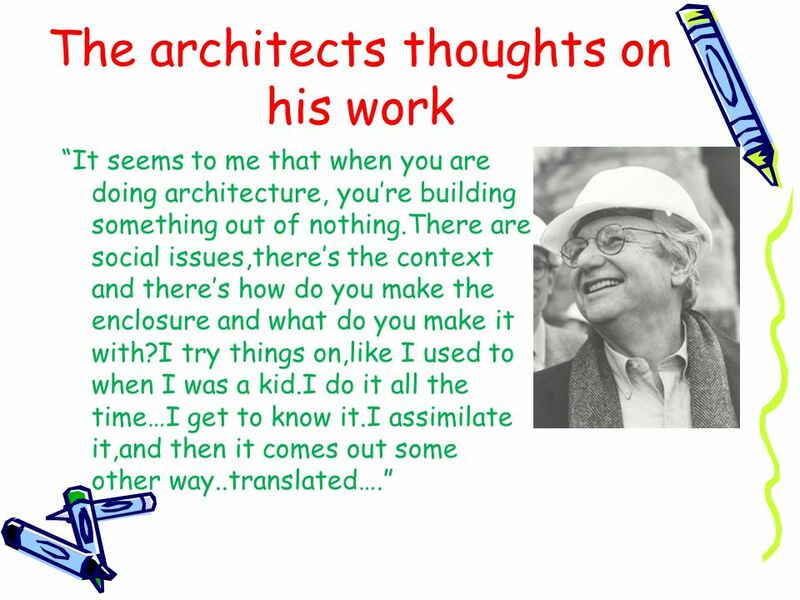 In 1999, he was awarded the AIA Gold Medal "in recognition of a significant body of work of lasting influence on the theory and practice of architecture." 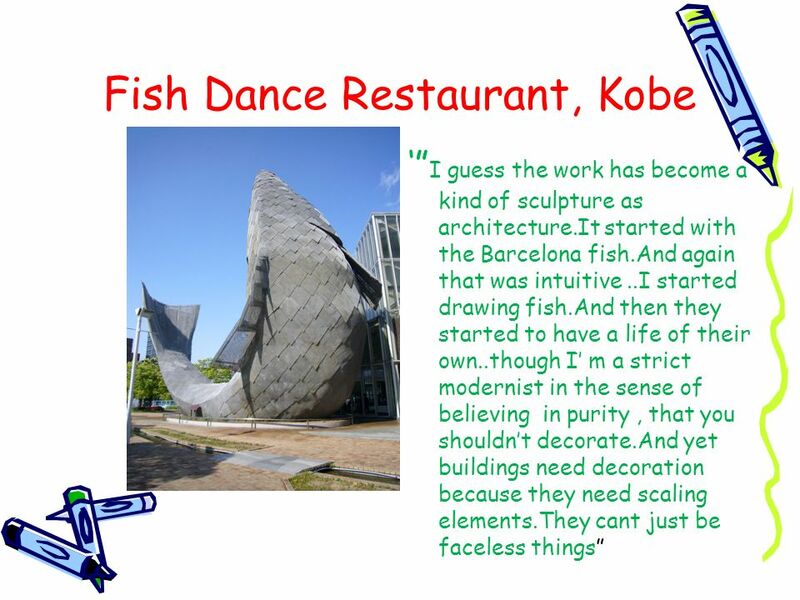 The buildings waste structural resources by creating functionless forms. 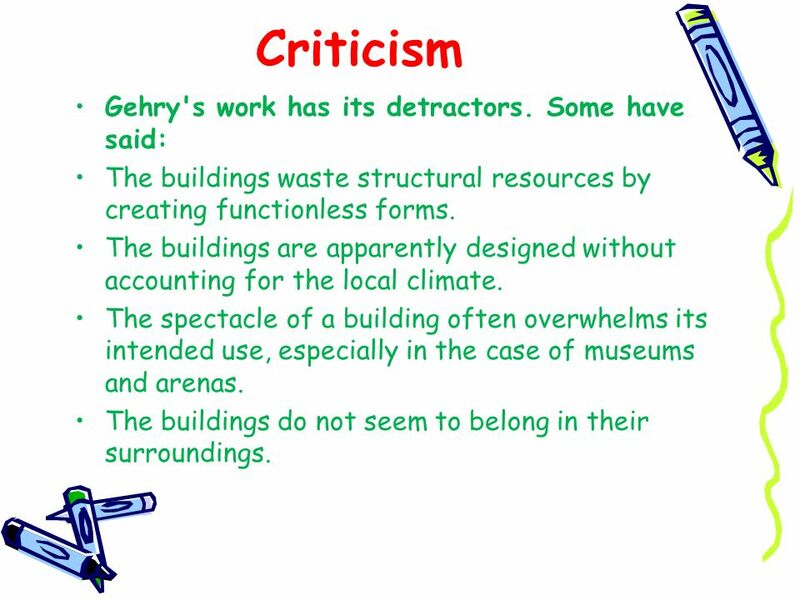 The buildings are apparently designed without accounting for the local climate. 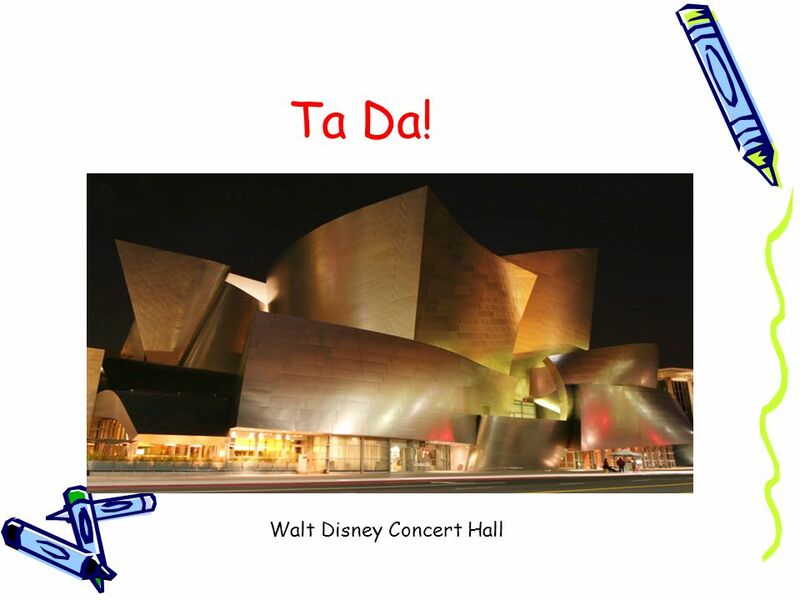 The spectacle of a building often overwhelms its intended use, especially in the case of museums and arenas. The buildings do not seem to belong in their surroundings. 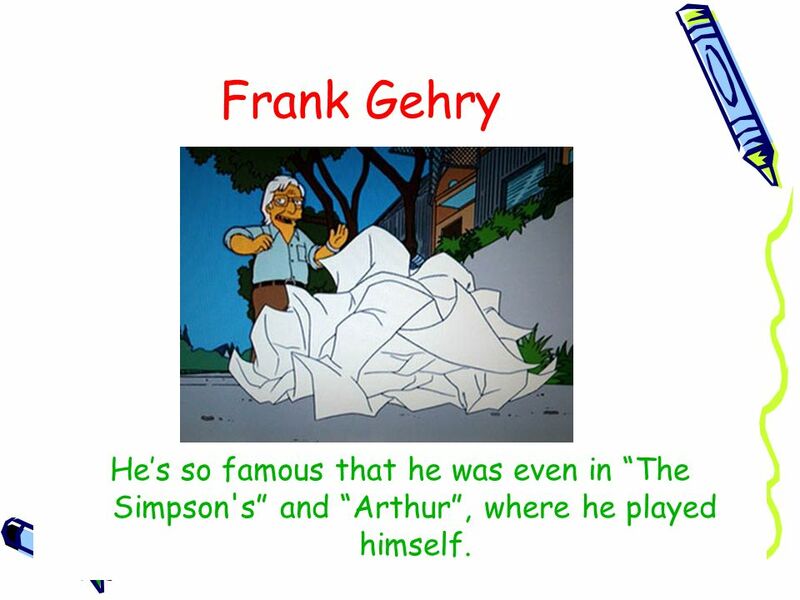 29 Frank Gehry He’s so famous that he was even in “The Simpson's” and “Arthur”, where he played himself. 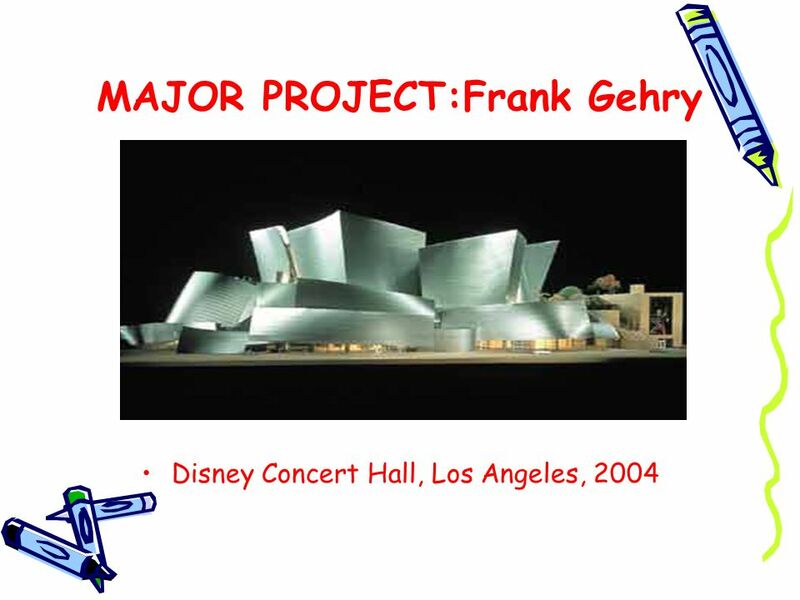 Download ppt "Architect Frank Gehry." Jasper Johns. When have you seen numbers today? How can numbers be art? American artist, Jasper Johns believes that even though we use numbers every. All of the surrounding buildings are older and traditional. 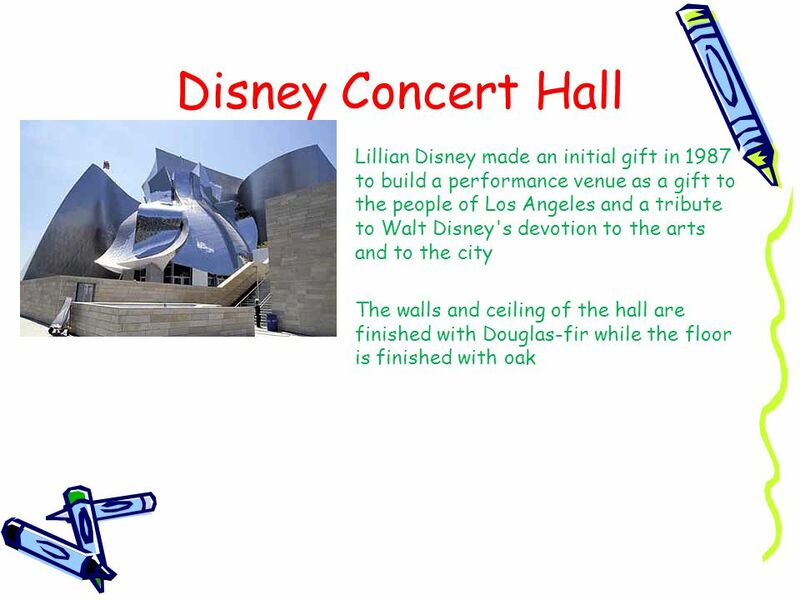 Frank Gehry sought to bring an organic form that makes it look like the building can be a celebration. By Lori St. Martin CD 225 – WCO – V2D1 Instructor John OLaughlin. 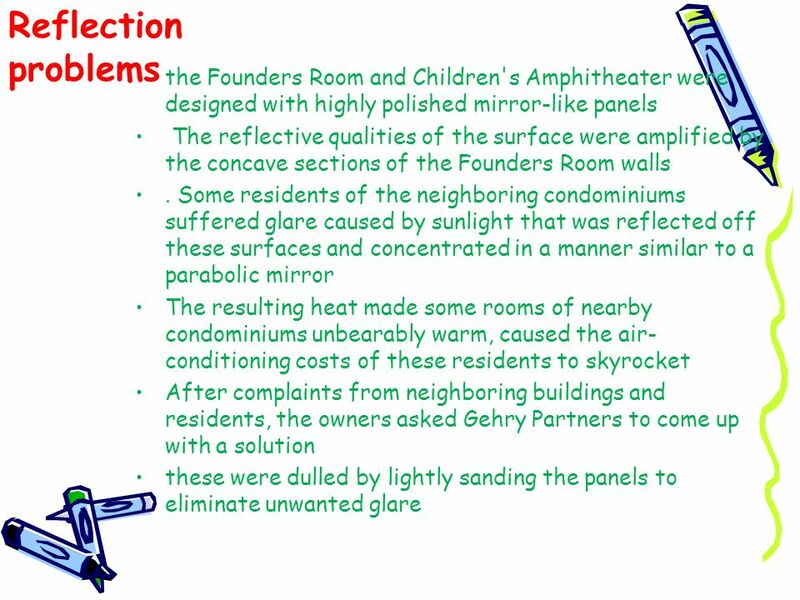 Prepared by Dr. Hazem Abu-Orf, Theories of Architecture(EAPS4202) Lecturer 7 19 th Century Architecture (Part 3) Functional Theory Dr. Hazem. Three Dimensional Stained Glass Sculpture. American artist born in 1848 and died in 1933. Architectural Detail Group, Inc ADG Lighting – fixtures & details all rights reserved © 2014 Net Zero Projects architecture & Interior design. 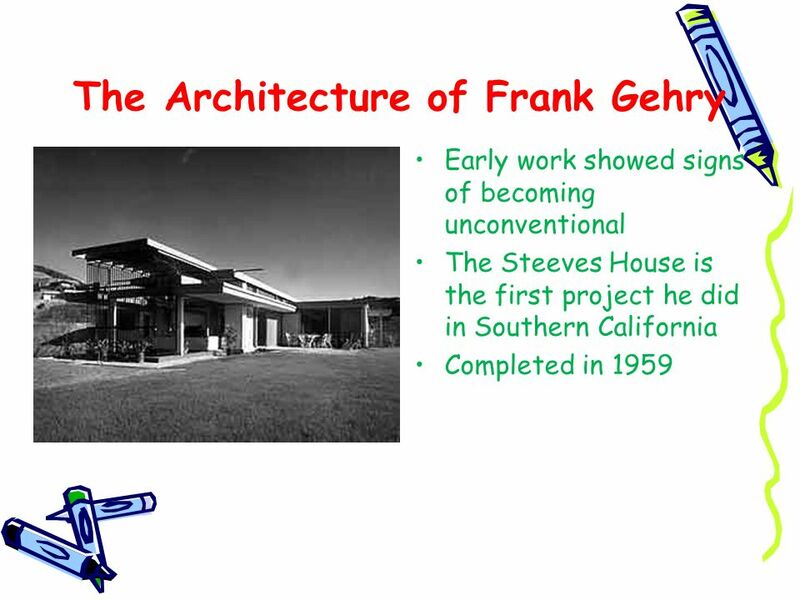  Was one of the most noticeable and significant architects of the first half of the 20° century. 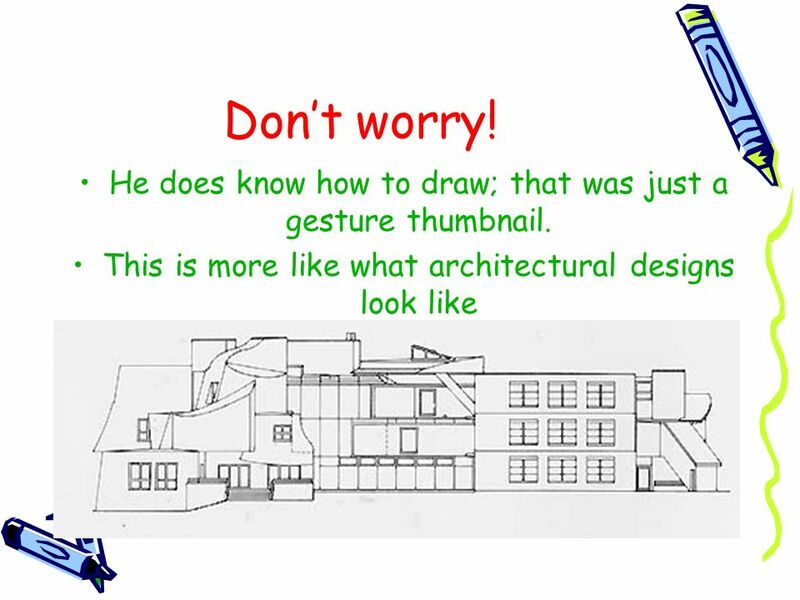  He spent a great deal of time playing with the kindergarten. 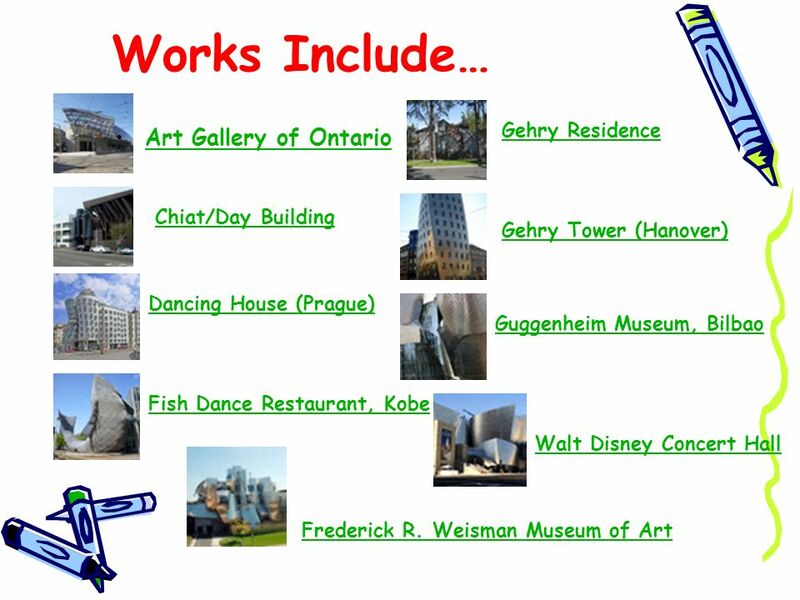 Project Title Eli and Edythe Broad Art Museum Award Category Building. Frank Lloyd Wright Age 22 in about 1889 AGE 89 IN 1956 ARCHITECT, INTERIOR DESIGNER, WRITER AND EDUCATOR. Structures and Their Designers. Meet the Designers. Contemporary house plans cater to a modern style of living. 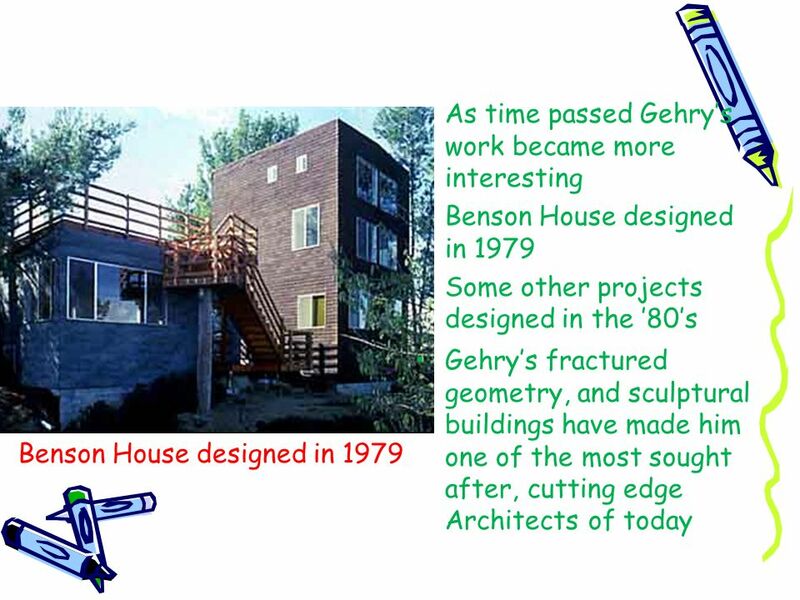 A low-energy house is any type of house that from design, technologies and building products. ELEMENTS OF CONTEMPORARY DESIGN ARE YOU THE TYPE OF PERSON WHO LOVES MIXED MEDIUM, SLEEK LINES, AND CLEAN DESIGN (WITHOUT CLUTTER)? 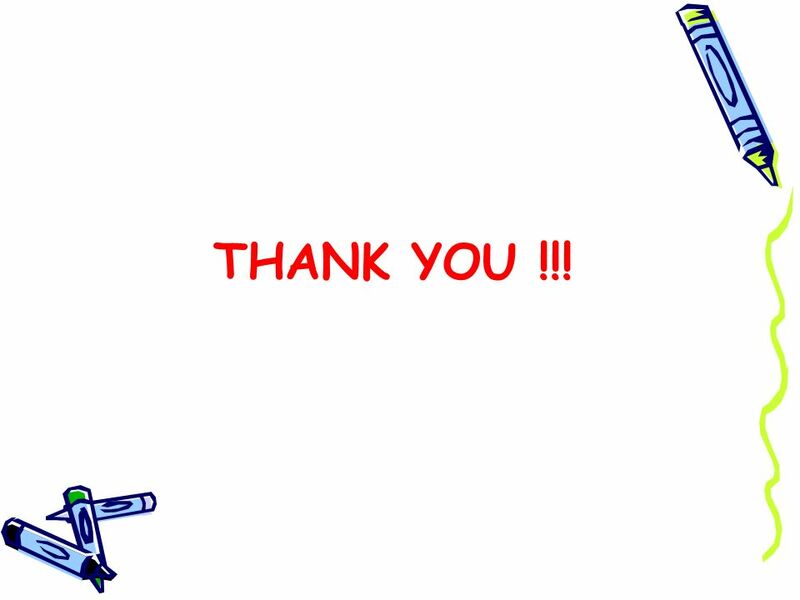 IF SO, YOU ARE THE. Frank Lloyd Wright Prairie Style Architecture. Importance of Prairie Architecture in Chicago Area One of the few architectural styles born in America. Housing Test #2 Review. Housing built into caves and cliffs in the American Southwest Pueblo. 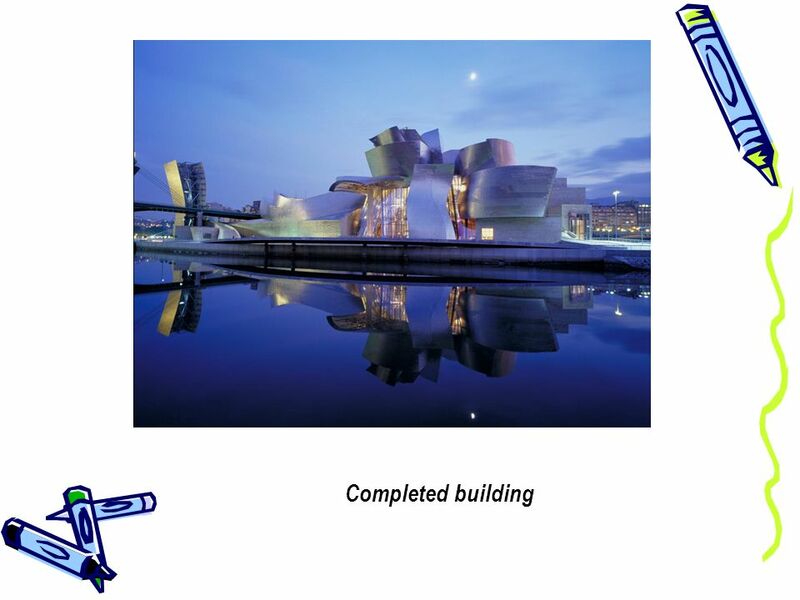 February 26, 2014 You need: –Vocab booklets –Something to write with Today’s activity: –Introduction to next project –Choose Partner & floor –Begin “floor. 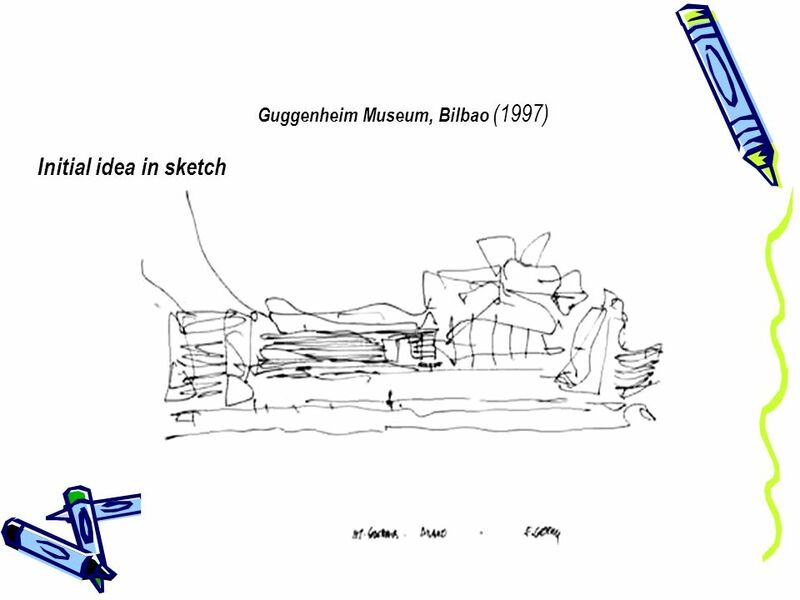 The Museum as Object. 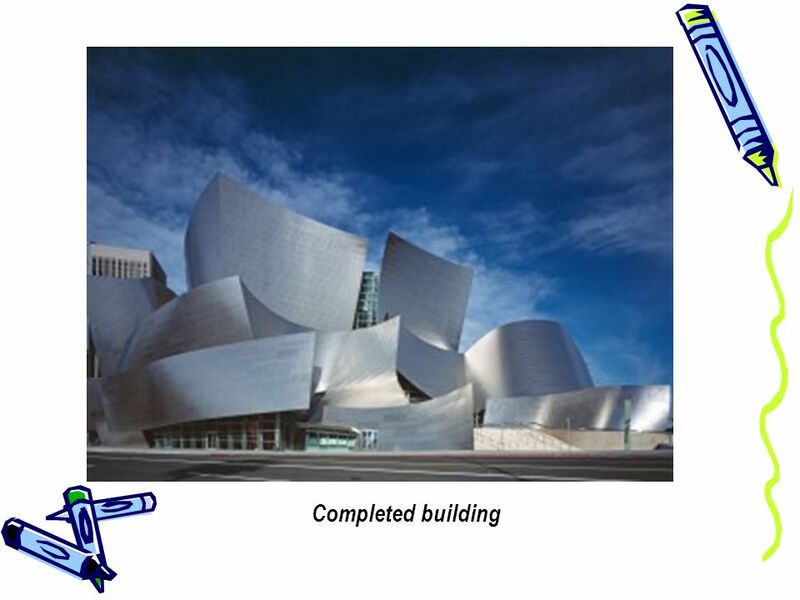 The Guggenheim Museum, by Frank Lloyd Wright, is one of the first examples of a museum designed by a “signature” architect. The. Modernizing Ancient Architecture Courtesy of Archivision.com. 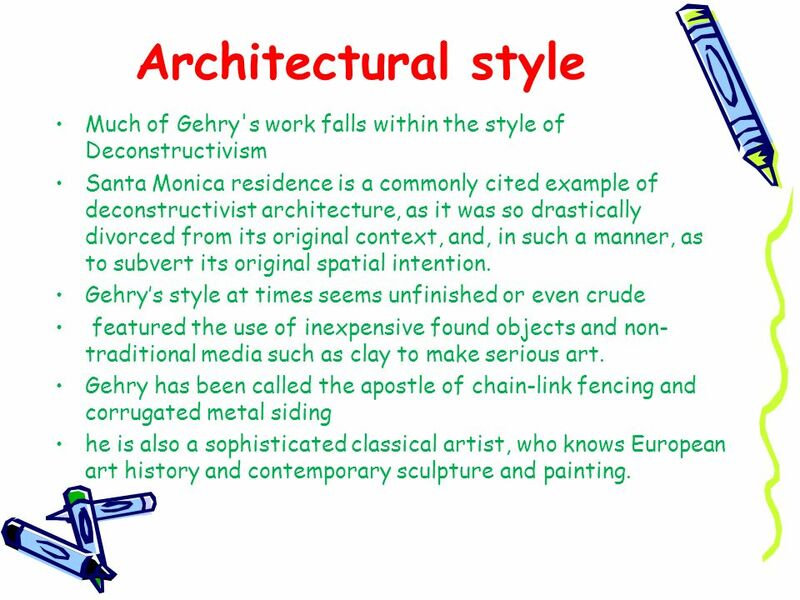  Postmodernity in architecture is said to be heralded by the return of "wit, ornament and reference" to architecture in response to the formalism of.